Disentangling the processes that drive population, community and whole forest structure and dynamics is a challenge. It becomes a grand challenge in the tropics where there are a large number of species, small population sizes, less research infrastructure, and a relatively smaller number of researchers compared to the temperate zone. Tackling this grand challenge, we argue, requires detailed knowledge of the functioning of individuals and species. To this end, researchers frequently employ plant functional traits to study tree populations and communities. Here, we review this approach by first providing a basic background regarding the major trait axes generally of interest. We then discuss how these axes may be or have been applied from ecosystem to community and population studies. In doing so, we highlight where the functional trait research program has failed in tropical tree ecology and where it can be improved or strengthened. Finally, we provide a perspective regarding how functional trait and emerging ‘omics approaches can be integrated to address large questions facing the field. Our intention throughout is to provide an entryway into this literature for an early career researcher rather than a comprehensive review of all possible studies that have taken place in tropical forests. Tropical forests are known for their vast complexity, which has long intrigued plant ecologists and evolutionary biologists alike (e.g., von Humboldt and Bonpland 1807; Wallace 1878; Dobzhansky 1950; Gentry 1988). This complexity ultimately arises from ecological interactions that drive evolutionary outcomes and vice versa. These ecological interactions are governed by how phenotypes and the abiotic and biotic environment interact. Thus, phenotypic differences between individuals and between species are of central importance for disentangling and understanding the drivers of tropical diversity (Swenson 2013). Measures of functional diversity are often employed to represent phenotypic differences across spatial, temporal, taxonomic, and size scales in tropical forests. Ultimately, our interest in functional diversity, in this review, is how it is related to demographic outcomes, which alter tree dynamics across scales from populations, to communities, to ecosystems (Ackerly et al. 2000; McGill et al. 2006; Baraloto et al. 2010). Calow (1987) wrote over three decades ago that to study functional ecology, physiological measurements that influence or can be influenced by demography and genetics would be needed. Today, functional trait measurements are often employed to investigate demographic drivers and their implications for diversity and dynamics of tropical trees (Poorter et al. 2008; Paine et al. 2011; Iida et al. 2014a; Liu et al. 2016). This link between functional traits and demography is fundamental to many areas of plant ecology including climate change and ecosystem services, conservation, community dynamics, and even plant ecological genomics (Swenson and Jones 2017; Garnier et al. 2018). Despite the great strides made in each of these areas for understanding tropical tree dynamics, the link between plant function, demography, and dynamics is still elusive. As first coined by Calow (1987) and Keddy (1992), functional traits are morphological-physiological-phenological traits measured at the individual level that directly impact fitness. Despite the large number of traits that could impact plant fitness or performance, the functional trait research program typically focuses on a set of commonly and easily measured traits (e.g., Westoby 1998; Westoby et al. 2002; Westoby and Wright 2006). It is thought that these traits represent fundamental tradeoff axes that indicate life history strategies, the abiotic and biotic interactions of individuals and species, and their overall fitness or performance given the abiotic and biotic contexts (Ackerly 2003; Swenson 2012; Adler et al. 2014; Funk et al. 2017; Amahowe et al. 2018). To begin the review, we will focus on the most commonly measured functional traits (i.e., the wood economics spectrum, the leaf economics spectrum, and seed economics spectrum) and later in the text we will expand our discussion of functional diversity to include a larger variety of traits and functions. The wood economics spectrum (Chave et al. 2009), like other trait spectra, depicts where a species falls along a continuum of allocation strategies that reflect life history tradeoffs. Specifically, high investment per unit wood volume (i.e., higher wood density) is negatively correlated with volumetric growth and mortality rates. Similarly, low wood density is positively correlated with volumetric growth and mortality rates (Enquist et al. 1999; Chave et al. 2009; Wright et al. 2010; Swenson 2012). Wood density is also essential for robust estimates of carbon storage, which is key in conservation strategies and dynamic global vegetation modeling (Chave et al. 2009). In addition to these well-characterized aspects of the wood economics spectrum, wood density measurements have also been successfully correlated with stem breakage and boring insect resistance; events that are becoming more common with climate change (Zimmerman et al. 1994; van Gelder et al. 2006; Swenson 2012). For these reasons, wood density is perhaps one of the most consistently useful functional traits when assessing tree demography and forest dynamics in the tropics and elsewhere. The leaf economics spectrum (LES) characterizes a tradeoff between photosynthetic rates and leaf lifespans where leaves with high photosynthetic rates tend to have cheaply constructed leaves with short lifespans and leaves with low photosynthetic rates tend to have leaves with high construction costs and long leaf lifespans (Reich et al. 1997; Wright et al. 2004). The traits used to characterize the LES are, typically, specific leaf area (SLA), leaf nitrogen content, leaf phosphorus content, and leaf lifespan. The SLA of a leaf is the area of one side of a fresh leaf divided by its oven-dry mass (m2 kg−1). It is also often represented as leaf mass per area (LMA) in the literature, which is simply 1/SLA (Cornelissen et al. 2003). Trees with high SLA, nitrogen, and phosphorus on one end of the spectrum are known to photosynthesize at a faster rate but have shorter leaf life spans, thus “cheap” investment in tissue but fast returns (Wright et al. 2004; Chave et al. 2009; Swenson 2012; Funk et al. 2017). The other end of the spectrum represents longer-lived, slower-growing trees with low SLA, nitrogen, and phosphorus (Wright et al. 2004; Donovan et al. 2011). Some work has shown that the wood economics spectrum is orthogonal to the leaf economics spectrum (Baraloto et al. 2010; Dwyer and Laughlin 2017; Amahowe et al. 2018). This contrasts with other work demonstrating a tight coordination between leaf and wood hydraulic traits (e.g., Santiago et al. 2004). There are multiple potential reasons for these discrepancies, but the standard practice should be to measure both axes. Lastly, seed mass is a commonly measured functional trait in tropical trees that forms the basis of the seed economics spectrum. Specifically, seed mass represents where a species falls along a continuum of making many small seeds or very few large seeds. Small seeds are less well provisioned (i.e., less endosperm) making them unlikely to establish in resource limited environments (e.g., shaded understories). However, they are more likely to reach high resource environments (e.g., canopy gaps) and typically have faster growth rates. Conversely, large seeds are more well provisioned making them more likely to establish in resource poor environments, while experiencing low growth and mortality rates (e.g., Grubb 1977). Thus, seed mass should be a leading indicator of plant life history strategies (e.g., Venable 1996; Moles et al. 2004). Indeed, seed mass is often one of the more informative traits tropical tree ecologists have studied (e.g., Wright et al. 2010), but it remains one of the hardest to measure traits due to difficulty in collecting seeds from many species with low population sizes and infrequent flowering events. At present, measuring functional traits is the standard approach when investigating tree demography (Poorter et al. 2008; Wright et al. 2010; Paine et al. 2015). Along with the large functional trait literature, more detailed investigations of physiology exist and were more common place in the context of tree demographic modeling in the 1980s and 1990s. For example, the most detailed compilation of work on the functional biology of tropical trees, focused only on interactions between the environment and a single or a handful of species at a time, was edited by Mulkey et al. (1996). Many of the studies in that volume focused on gas exchange or other metabolic fluxes as ecophysiological traits of interest, which are difficult to obtain in the field for large numbers of individuals (Swenson 2013). During the early 1990s, studies were also investigating aspects of plant function along environmental gradients (Ellsworth and Reich 1992; Kitajima 1992; Osunkoya et al. 1994). For example, Kitajima (1996) focused on the effects of seed mass for survival and quantified early forms of what are now popularized functional traits along a shade tolerant to light demanding spectrum. Other studies were finding that seedlings with high specific leaf area had shorter leaf life spans, faster leaf turnover rates, and high photosynthetic rates (Bongers and Popma 1990; Kitajima 1994). Thus, while most of the current focus on the functional biology of tropical trees circles around a few easily measured traits, there is a rich body of literature on more detailed physiological measurements. In the following, we will discuss the functional trait literature, but push the reader to consider enhancing functional trait research with more detailed physiological and genomic measurements of the functional diversity of tropical trees. Below, we highlight three main areas where functional traits and their linkages to tree demography and forest dynamics have had large impacts: climate and ecosystem change, community dynamics, and ecological genomics. We will guide the reader through trait-based research in these areas, give examples of detailed analyses, and highlight research shortcomings and future progressions. The relationship between functional traits and the demographic rates (i.e., growth rate, survival, reproduction) of tropical trees is dependent on the environmental context. Thus, any change in the environment will alter the demographic rates of trees and the functional composition of forests and forest dynamics. The environment is currently changing at unprecedented rates and extreme events such as drought, fire, insect and pathogen outbreaks, and hurricanes that greatly impact forest composition and dynamics are becoming a routine (Bigler et al. 2007; Jentsch et al. 2007; Chave et al. 2009; Choat et al. 2012; Esquivel-Muelbert et al. 2017; McDowell et al. 2018). With the increase in major events, researchers are looking for ways to better predict the future climate and the fate of tropical forests. A knowledge of how traits relate to demographic rates and how these relationships are modified by the environmental context is, therefore, essential for making such predictions. As the effects of climate change become more apparent, researchers are striving to predict future climatic and vegetation patterns. Dynamic global vegetation models (DGVMs) are often central to these predictions. Current DGVMs vary in their detail regarding the functional diversity in tropical forests with some including only one to a few functional types rather than a continuous distribution of functions (Díaz and Cabido 1997; Baraloto et al. 2010; Xu et al. 2016; Butler et al. 2017; Maréchaux and Chave 2017). While some inclusion of functional types is better than excluding plant function all together, such models fail to capture trait variation and should break apart these functional types into specific functional trait measurements for each species to incorporate more axes of plant function and continuous variation in traits (Wright et al. 2005; Baraloto et al. 2010; Funk et al. 2017). The challenge going forward is to develop a new generation of DGVMs that can deal with this continuous variation and models that can utilize both widely measured functional trait information (e.g., Fyllas et al. 2012, 2014; Maréchaux and Chave 2017) and less commonly measured physiological (Xu et al. 2016) and functional genomic measurements (Swenson 2012; Swenson and Jones 2017). Along with predicting future climate, many of these models have the potential to predict relative abundance of species in designated areas (Laughlin and Laughlin 2013; Funk et al. 2017). This information would give insight into the resistance and resilience of different species (i.e., their capacity to maintain populations to alternations in the environment) to changes in climate and local adaptation capacity of species. Climate-based species distribution models currently predict the extensive redistributions of some tree species over the next century (Aitken et al. 2008). However, many of the predictions made by these models do not account for the actual ability of species to migrate or locally adapt (Aitken et al. 2008). Improved accuracy of these models can be gained with a better understanding of differential demography of species that incorporates phenotypic variation and abiotic and biotic interactions (Díaz and Cabido 1997). The parameterization of DGVMs can benefit greatly from long-term forest monitoring where tree demographic rates are tracked in detail. In those instances where traits can be linked to species (e.g., Iida et al. 2014a), or even individuals (e.g., Liu et al. 2016; Umaña et al. 2017a; Umaña et al. 2018), this information should and can be fed back into the DGVM parameterization process. Unfortunately, such long-term studies are often lacking. Those that do exist often observe individuals at 5-year intervals (e.g., Kraft et al. 2010; Iida et al. 2016), which does not allow the research to identify the impacts of acute and extreme events. Thus, going forward, observational studies of individuals on, at most, yearly time scales coupled with, preferably, individual level trait measurements would be a necessary next step for delineating how traits and demographic rates are related as the environment changes. One potential outcome of such work could be that individual level trait or rate measurements are not necessary for powerful modeling of future forest states, but individual level studies should first be conducted to remove this possibility or at least to provide more detailed prior distributions. Community ecology has taken the greatest advantage of the functional traits research program thus far. Specifically, functional traits have been used by community ecologists to elucidate and decipher patterns of species richness, abundance, and demography over space and time (e.g., Kitajima 1994; Mulkey et al. 1996; Swenson and Enquist 2007; Kraft et al. 2008; Poorter et al. 2008; Swenson and Enquist 2009; Wright et al. 2010; Katabuchi et al. 2012; Paine et al. 2012; Baraloto et al. 2012; Umaña et al. 2016, 2017). For example, Swenson and Enquist (2007) published one of the first analyses of community-wide diversity of a functional trait, wood density, in co-occurring tropical tree species demonstrating that assemblages are more diverse in this trait than expected given their high species richness. From here, a multitude of studies investigating environmental filtering (e.g., Swenson and Enquist 2009; Kraft and Ackerly 2010; Shipley 2010; Katabuchi et al. 2012; Kunstler et al. 2012) versus niche partitioning (Baraloto et al. 2006; Kraft et al. 2008; Paine et al. 2011; Lasky et al. 2015) using trait dispersion patterns were published. While important, these early studies typically focused on static snapshots of a forest composition and did not include temporal dynamics or demographic rates. More recently, this has changed and a greater focus has been placed on how traits are related to demography and ultimately forest dynamics (e.g., Alvarez-Clare and Kitajima 2007; Poorter et al. 2008; Aiba and Nakashizuka 2009; Uriarte et al. 2010; Chaturvedi et al. 2011; Fan et al. 2012; Swenson et al. 2012; Iida et al. 2014; Paine et al. 2015; Liu et al. 2016; Poorter et al. 2018; Rüger et al. 2018). Foundational to nearly all trait-based studies in community ecology is the expectation that the traits measured are related to individual-level demographic performance. Thus, correlations between a single trait of interest and some environmental variable or demographic rate have been performed to explore co-occurrence and try to explain the vast diversity of trees seen in the tropics. However, in many instances, the relationships found between functional traits and these variables are often weak (Baraloto et al. 2012; Paine et al. 2015; Yang et al. 2018) and unable to explain the great diversity of form and function seen (Marks and Lechowicz 2006). For example, Paine et al. (2015) modeled the effects of functional traits (SLA, wood density, and seed mass) and potential evapotranspiration (PET) on size-standardized relative height growth rates (SGR) of 278 species globally and found that functional traits only explained 3.1% of the variation. Poorter et al. (2008) reported Pearson correlation coefficients between functional traits and relative diameter growth rate and mortality rate for five neotropical forests and found between 2 and 74% of the variation explained depending on the trait and location. The range in the amount of variation explained draws attention to the complexity that each forest brings to trait-rate relationships (Fig. 1a). 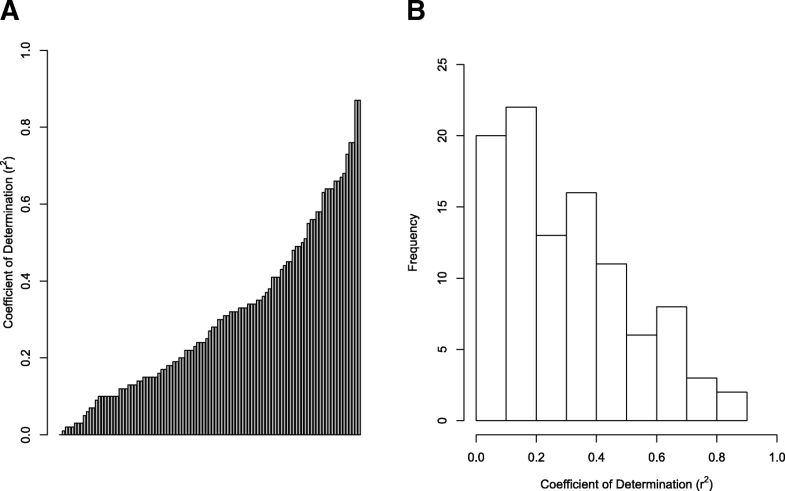 A low percentage of variation explained (r²) is a common theme in functional trait tropical plant community ecology (Fig. 1b). This is alarming as it may indicate that the foundation of functional trait-based tropical tree ecology is far weaker than commonly portrayed. Thus, a major current challenge in tropical tree ecology is to clearly identify the axes of function that most clearly predict tree performance and to identify the reasons why previous work has explained so little variation. It has been stated that weak trait-demography relationships stem from a lack of consideration of the environment (Paine et al. 2015; Garnier et al. 2018; Yang et al. 2018), ignoring individuals in favor of species (Liu et al. 2016; Yang et al. 2018) and/or not considering all relevant dimensions of tree function (e.g., Swenson 2013; Iida et al. 2016; Swenson et al. 2017; Garnier et al. 2018; Yang et al. 2018). In the following, we will discuss each of these possibilities in turn and how tropical tree community ecologists should investigate or consider each of them in the future. At regional or larger scales, studies have shown that climate and soil affect the slopes and intercepts of trait-trait and trait-climate relationships (Wright and Westoby 2002; Wright et al. 2005; Maire et al. 2015), but few tropical studies have tested for environmental effects at smaller scales where most of the literature is focused on herbaceous systems (Freschet et al. 2010; Dwyer and Laughlin 2017). For example, Laughlin et al. (2018) showed the importance of including environment-trait interactions in models of plant survival by comparing the traditional likelihood approach, where the trait is a function of the environment, to the vital rates approach that includes an interaction term between the trait and the environment. This type of analysis must be expanded to tropical forest systems to support known theory that diversity and dynamics are driven by differential demographic rates that result from phenotype-environment interactions (Fonseca et al. 2000; Ackerly 2003; Cavender-Bares et al. 2004; HilleRisLambers et al. 2012; Anderson 2016) (Fig. 2). These future studies have the potential to address a long-standing challenge in community ecology of explaining the vast diversity of forms and functions of trees in the tropics. In most functional trait studies, mean trait values are used for each species with the belief being that intraspecific variation in these traits is relatively small compared to interspecific variation (Albert et al. 2011; Albert et al. 2012; Adler et al. 2013; Funk et al. 2017; Yang et al. 2018). However, species averages undermine the importance of intraspecific variation in processes of community assembly, coexistence, and ecosystem functions (Burton et al. 2017). For example, Messier et al. (2010) was one of the first to show the importance of intraspecific variation by finding approximately equal partitioning of variance in leaf dry matter content (LDMC) and leaf mass per area (LMA) within and among tree species. Furthermore, Umaña et al. (2015) has shown the importance of intraspecific variation in traits and growth rates on species abundance. Of course, we realize the difficulty in obtaining trait data for every individual in a study. However, when working at smaller spatial scales, having intraspecific variation is critically important (Albert et al. 2011). Having this individual level variation in functional traits will allow an understanding of individual performance thus linking demography and evolution (Anderson 2016). Our understanding of the interactions between multiple functional traits and plant performance was and still is a major challenge in community ecology (Ackerly et al. 2000; Dwyer and Laughlin 2017). In the majority of studies, however, traits are examined individually or summarized into single indices to decrease the dimensionality of an analysis. This approach contrasts with a literature calling for the inclusion of multiple functional traits when trying to understand plant demography (Ackerly et al. 2000; Ackerly 2003; Marks and Lechowicz 2006; Adler et al. 2014; Enquist et al. 2015; Dwyer and Laughlin 2017a, Dwyer and Laughlin 2017; D’Andrea et al. 2018). Recent work that incorporates multiple functional traits into analyses of demography has met this call, albeit typically in temperate herbaceous systems (Laughlin and Messier 2015; Dwyer and Laughlin 2017). The use of allometries should become more common to circumvent this issue by integrating functional trait measures with whole-plant allocation. Scaling relationships influence many aspects of plant form and function as they are controlled by the physiological and architectural constraints of the plant (Enquist and Niklas 2002; Bonser 2006). For example, plant growth rate is known to scale isometrically with leaf biomass (Niklas and Enquist 2002; Niklas and Enquist 2002a). Yang et al. (2018) have demonstrated that by knowing the allocational context of LMA, the trait-rate relationship is greatly improved. Unfortunately, we currently lack the necessary information for most species-specific allometries, especially for tropical species, and general allometric equations must be used. Remote sensing offers one potential alternative way of solving this issue as it could generate rapid inventories of crown dimensions for entire study sites that could be integrated with leaf level traits. A related issue regarding dimensions of function asks, “What dimensions or functional traits are actually relevant and are we actually measuring them?”. The most commonly used functional traits are actually indirect measures of physiological rates or “soft functional traits,” which could be a major issue in why the percent of variation explained by functional traits of vital rates is so low (Hodgson et al. 1999; Weiher et al. 1999; Cornelissen et al. 2003; Wright et al. 2010; Swenson 2012; Funk et al. 2017) (Table 1). Incorporation of “hard functional trait” measurements, such as photosynthetic rate, stem and leaf hydraulics, and chemical defenses, that directly measure a rate or process into data collection has seen a slow increase (Hodgson et al. 1999; Weiher et al. 1999; Lavorel and Garnier 2002). This is expected as many of these traits are time-consuming to measure and costlier to obtain (Paine et al. 2015). Along with the rapid increase in the usage of functional traits in ecology has been the increase in DNA and RNA sequencing capacity. This increased capacity has also come at a reduction in cost that makes true ecological genomics a reality in temperate and tropical systems. We envision that the ‘omics revolution can and should be immediately integrated with research into functional diversity, demography, and forest dynamics. This integration should be accomplished on many fronts. This includes forging the integration of data regarding intraspecific trait and genetic variation that is so clearly absent and desperately needed (Crutsinger 2016). Investigating the genetic basis of trait variation has the potential to provide understanding into the physiological processes that allow species to persist globally (Akman et al. 2016). Another clear opportunity for transformative science will come from the integration of transcriptomics and functional ecology where detailed assays of functional genes and their expression can now be obtained (e.g., Swenson 2012; Swenson et al. 2017; Swenson and Jones 2017). In the following, we will describe some of the research that has already been conducted in these realms as well as immediate opportunities for investigation. A major limitation of trait-based studies is the measurement of only a handful of traits. This has two downstream consequences. First, traits or axes of function of interest that are difficult to measure (e.g., defense) are not measured. Second, axes of function that are important but not considered important or totally unknown are not measured. Transcriptomics, RNA sequencing of a tissue or tissues, assays the functional genes expressed in a sample and returns the abundances of transcripts, which offers to transform functional ecology in the next decade (Swenson 2012). This will be largely driven by falling sequencing costs, increases in cyber-infrastructure, and, most importantly, comfort dealing with analytical tools designed to work with non-model system data. Most ecological genomics or transcriptomics studies to date have been severely limited to a few model (or near model) systems and/or in highly controlled experimental settings both of which fail to represent the complexity of ecological systems. However, recent work has been accomplished that compares many species simultaneously and successfully translates the results to ecological questions of general interest. For example, multiple studies have now investigated homologous gene similarities as it relates to drought effects (Kobayashi et al. 2013; Swenson et al. 2017), light responses (Han et al. 2017), and even defense (Zambrano et al. 2017). Specifically, Zambrano et al. (2017) annotated homologous gene trees for plant defense responses across 21 temperate species to test the Janzen-Connell hypothesis on species coexistence. Bowsher et al. (2017) determined differential gene expression in competition experiments for co-occurring Trifolium species to highlight potential niche axes differentiation that allow species to coexist and Kobayashi et al. (2013) investigated the environmental influence on mass flowering of the tropical tree Shorea beccariana [Dipterocarpaceae]. While less common, studies of gene expression (rather than just comparisons of homologous or orthologous gene sequence similarity) are likely to become particularly important in functional ecology and linking function to demographic outcomes. The relationship between genes, their expression, and phenotypes is complex, but can provide insight into understanding how ecological and evolutionary processes affect phenotype (Hersch-Green et al. 2011; Alvarez et al. 2015). This relationship is especially important for individuals or species showing alternative phenotypes where gene expression can potentially help explain the divergence in phenotypes, resource strategies of each type, and demographic outcomes (Alvarez et al. 2015). While identifying the link between genotype and phenotype is still impractical for tropical trees, gene expression patterns can highlight candidate genes that are associated with ecological effects. The downside of transcriptome analysis is perhaps, at the same time, its upside; many genes that appear related to observed ecological patterns may currently have no known function, but this allows candidate genes or gene families to be identified as being of ecological interest for future research (Swenson 2012; Alvarez et al. 2015; Todd et al. 2016). Studies that analyze gene expression patterns in tropical trees are rare due to the difficulty of collecting samples for RNA isolation in the field and, in general, the high costs of RNA-based research (Akman et al. 2016). Fortunately, costs of gene expression studies are steadily declining making future application to tropical trees promising. The uses of genotype information in plant ecology are broad including its uses in understanding the abundance, composition and diversity of herbivores and arthropod species (Crutsinger et al. 2006), plant performance and coexistence (Crutsinger et al. 2008; Shao et al. 2018), and ecosystem services (Hersch-Green et al. 2011; Zytynska et al. 2011). One key aspect of genotypic data is potentially having the proportion of genetic variation which can be linked to functional trait variation and responses to the environment (Albert et al. 2011). Of course, untangling genetic (G) and environmental (E) influences on functional traits is a major undertaking causing a dearth in tropical tree G × E experiments (Alberto et al. 2013; Crutsinger 2016). In general, there has been a lack of integration between community genetics studies and functional trait studies despite repeated calls for research that considers both simultaneously (Díaz and Cabido 2001; Hughes et al. 2008; Hersch-Green et al. 2011; Crutsinger 2016). The few studies that have taken on this challenge were able to dissect heritability of trait variation and the distribution of that variation in the community (Johnson and Agrawal 2005; McKown et al. 2014; Barbour et al. 2015). For example, to better understand and predict future species richness and abundance, researchers are analyzing patterns of phenotypic plasticity and local adaptation using functional traits and genotype information with the idea that plastic ability will increase the odds of survival as climate changes (Anderson 2016). We expect that future genotyping efforts in tropical forest ecology will increasingly take advantage of assembled genomes. This likely will start with a single genome being sequenced for a given major lineage of tropical trees that can be used to design sequence capture probes across a genus and to annotate functional and non-functional genes whose variation is being quantified in population genomic studies. Thus, while the production of assembled genomes may occur for a myriad of reasons that are not immediately associated with ecological questions, these genomes likely can be immediately leveraged for detailed studies of tree demography and the relatedness and functional gene similarity of the individuals being studied. Such work will accelerate a synthesis of functional ecology, population and community ecology, and evolutionary ecology allowing the next generation of tropical field ecologist to address some of the most important questions facing biology. In this review, we have shown how functional traits have and will continue to have large impacts in major areas of tropical plant ecology. Throughout the establishment of plant functional trait-based ecology, simplification of the field has been urged (Díaz et al. 1998). Despite the ease that this simplification has brought, we have now reached a point of expansion and integration of trait-based ecology which adds complexity to data acquisition and analyses (Clark 2010). As advances in functional trait-based ecology increase, however, it is important to remember the investment it takes to amass adequate data to carry out research in each of the areas mentioned above. At the core, tropical inventories of species and even individuals and their functional diversity are needed. In order to reach a main goal of trait-based ecology, scaling from individuals to ecosystems, we must integrate and synthesize across multiple fields including physiology, population biology, community ecology, ecosystem ecology, and global ecology (Enquist et al. 2015). In particular, stronger incorporation of evolutionary thinking into all areas of tropical tree ecology is needed, especially if we hope to find the elusive link between functional traits, demography, and dynamics across scales (Garnier et al. 2018; Yang et al. 2018). We thank two anonymous reviewers of the manuscript for constructive comments that improved the quality of our writing. We thank the University of Maryland for ongoing research support. SJW and NGS were funded by a US National Science Foundation grant (EF-1638488) awarded to NGS. SJW wrote the initial drafts of the manuscript with comments from NGS. SJW and NGS worked together to form the ideas and framework for the manuscript. Both authors read and approved the final manuscript.